Welcome to Tomorrow, Meet the Tomorrow Sleep Hybrid Mattress! Since Tomorrow is backed by Serta, you expect to get a certain level of quality craftsmanship with their products. After I unboxed it, I jumped on it and was a bit shocked by how soft yet supportive it was. Most hybrid mattresses have a bit of a “oh there’s the coil layer” feel to them. After I shot my unboxing video of the Tomorrow, I said “wait this isn’t a hybrid, there aren’t any coils in here”. So there I was thinking about how I need to find a way to dub over my unboxing to say that it’s an all foam mattress. I went back to the Tomorrow website to check, sure enough they say it is a hybrid. Their homepage says, “The Highest Rated HYBRID on the Internet”. Then, I had to go on a quest to figure out where their coils or springs were hiding. What they do with their wrapped coils is not just creative but it’s functional. By having this outer layer of foam to hold everything together, they prevent you from feeling them when you sit on the edge of the bed. 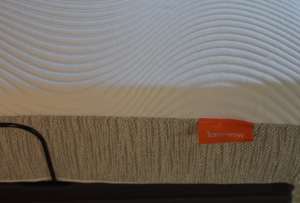 In other hybrids you can feel their coil system when you touch the sides of the mattresses. See, I told you there are coils in there! 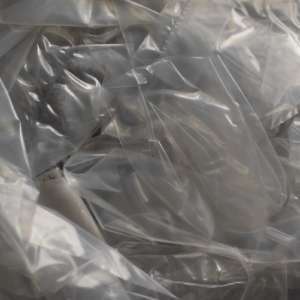 On the top 2 layers you will find gel infused in the viscoelastic polyurethane (memory foam). You can feel the cooling sensation when you take off the fire sock. The top layer isn’t very dense so it has that memory foam feel (hugging). The second, aqua colored, layer is much more dense so you won’t feel the coils that are hidden behind the white layer in the picture. Solid Warranty and 100 day trial. How is this for confidence in their product, they upped their Warranty to 365 days. A hybrid mattress that feels like an all foam mattress. This isn’t a joke, you get the stability from a hybrid without noticing the coils. I stopped filming my unboxing video to check for the coils. I was pushing on the bed, punching it, jumping on it, and then I opened up the mattress, it has a zipper. Starring at a fire sock, still no coils. Even after I cut through the fire sock I couldn’t see them. I stuck my finger in the holes in the white layer of foam and finally found them. The top 2 layers are gel infused, so they are cool to the touch. The top layer is less dense than the second one so it hugs you like you would expect from memory foam. I’m always a bit worried when I use a hybrid mattress on an adjustable frame, but this works great since it has individually wrapped coils. The corners of my mattress didn’t fill out for 2 days, so the mattress didn’t look amazing. Imagine a sock just before you pull it all the way to your toes, it just wasn’t quite right at first. Turns out it just needed some time for the foam to expand. Overall this wasn’t a big deal, it just took away a bit of the excitement when I first opened it up. The wrapped coils don’t go all the way to the edge, so if you stand it on its side it will fold over like a taco. Once you put it on your bed you aren’t going to encounter this issue. However if you move it is important to keep it as flat as possible. The box comes equipped with handles and some motivational messages. 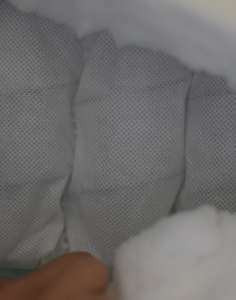 Inside the box you will find the mattress tightly wrapped and compressed. Interested in a Tomorrow Sleep Hybrid Mattress? Want to know more about other Tomorrow Sleep Products?